City Calvary Chapel and the Shoreline Seventh-day Adventist Church are once again pairing up to supply weekend groceries for 30 selected Ridgecrest Elementary students. Only prepackaged, individual serving sized items can be used. Food and funds are donated by these church families and by volunteer food drives. The food is stored at CCC and packed into bags for delivery to the school. If you would like to volunteer or donate to this program, contact City Calvary Chapel at 206-709-9416, Heidi Skersies at 206-601-3705 or the Adventist Church at 206-363-2355. The photo shows volunteers packaging weekly bags with donated cereal, soups, milk, juice, mac and cheese boxes, granola bars, fruit packets, etc. For more information about the Shoreline programs, see Food4KidsShoreline. These groups provide food packages to chronically hungry students from low income or homeless households who are at risk of hunger over the weekends when free school meals are unavailable. 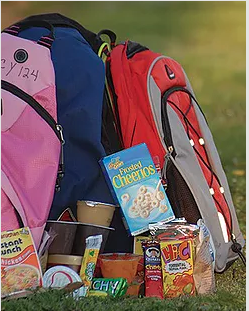 Every Friday students are discretely given a bag of food containing easy to prepare foods which is then tucked into their backpacks and brought home.